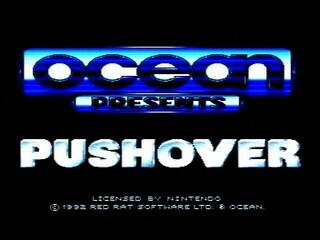 Released by Ocean in 1992, Pushover is a domino based puzzle game. Controlling a protagonist by the name of G. I. Ant (because ants and dominoes go together like peanut butter and jelly) your goal is to knock over all the dominoes in each level in one continuos chain. Sounds simple enough, but between some bizarre stage layout and dominoes with special properties it can become quite tricky. Best time: Single-segment 1:00:24 by Pierre 'KartSeven' L'Hoëst on 2012-08-31. It's my second submission to SDA, and it's a new game for the site ! About the run itself, I did a very few mistakes (at levels 30, 60, 79 and 86), and there are some levels where I didn't try the best strat, cos it was too risky and they save only 1 or 2 seconds (like levels 45, 59, 66 and 82). But I also noticed I could do better in some levels by watching this video after the speedrun ! :-D Either it's just because I didn't write the best strat before the speedrun (like levels 3, 11, 15 and 98), or because I discovered a better strat by watching the video (like levels 85, 87, 95 and 96). In any case, all these little mistakes cost 1 or 2 seconds, so I'm pretty proud by the final result : 85 levels were completed in the same time than my record, 11 slower by 1 second, and only 4 slower by 2 seconds !